Synopsis : Single mother Samaira juggles her corporate job and Aksh, her teenaged son, even as she defies society, disapproving in-laws and her own family. But when Aksh is found battered and beaten at school, she finds herself questioning her role as a mother. Faced with a conspiracy of silence from the school, she delves deeper only to discover the murky world of bullying, the secret life of teenagers, and the emotional distance between parents and children. In her pursuit of truth and justice, Samaira ends up challenging the power equations of politics, wealth and influence. 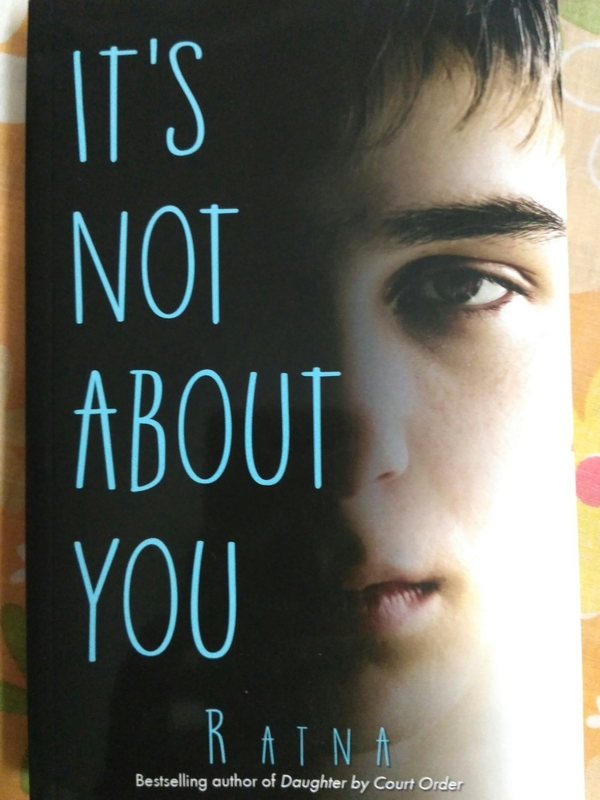 It’s Not About You is an urgent, contemporary tale that celebrates the persistence of the human spirit to fight against all odds. My view : All of us have at some point faced the disastrous effects of bullying. Sometimes we have stood up to the bullies whereas at other times we have chosen to ignore till it passes. However, the one absolute solution to this issue is discussing it with parents or other supporting adults, who with their sound counsel and appropriate measures can curb the hazard. Yet, most tend to avoid this solution and end up being oppressed. Ratna Vira’s second novel It’s Not About You brings forth the environment of endless bullying and its consequences. Samaira, adoringly known as Sammy, is a single mother of Tara, 20 and Aksh, 16. In spite of a troubled past and a disputed domestic household, she has ensured that her children are engulfed in love and care. One morning, a phone call from Aksh’s school brings her world crashing down. Her young boy is found bruised and wounded on the basketball court of the school and no one knows anything about it. Sleepless night and tiresome days in the hospital mark her schedule. She is torn between the concern for her son’s health and the mystery behind the real perpetrators of the assault. The story takes us through the mental and physical stress that bullying can cause to a child and how deeply it is seated in the minds of the victim. The helplessness of the parents shines through. Sammy battles her own bullying issues and takes a stand for her kid. Her struggle and fight against the oppressors is brilliant and makes us admire her strong personality. The connection between her and the kids is portrayed excellently. Their bonding made my smile and a warmth spread through my body. Rishi is a caring father. Although he has divorced Sammy, he doesn’t leave her in the troubled times and stands by the family and helps them out. The characters of the story are well outlined. The dialogues are nicely thought and written. However, the pace of the story was mostly slow and inactive. For most part of the book, there was nothing consequential happening and there was a lot of repetition. I was mildly irritated because of the inaction. The ending seemed rushed and I think it did not do any justice to the book. What could have been an engaging plot, was quickly finished off in the ending. The actual incidents of the day were revealed at the end and I was not satisfied with the way it was quickly done and dusted. Every chapter in the book starts with a small quote resembling the ongoing circumstances in the book at those points. It was a new idea but it did not appeal to me as I found it distracting at times. In spite of the few shortcomings, Ratna Vira’s book is characterized by the brilliant capture of the emotions of a mother whose son is battling his death. The book brings out empathy and sadness in the readers and also focusing on strong family ties. Ratna Vira is a human resource and communications professional with a master’s degree from London School of Economics, a master’s in English Literature from St Stephen’s College, and an MBA. She lives in Gurgaon with her daughter and son. She is the author of the bestselling novel, Daughter by Court Order.